WINNIPEG, Manitoba (Reuters) - Canada's struggling oil industry is looking to what is known as partial upgrading technology to thin its sludge-like crude and squeeze more of it through congested pipelines. Producing a medium grade would give the world's fourth-largest producer more of a different type of crude to sell that does not compete with abundant U.S. light shale oil. 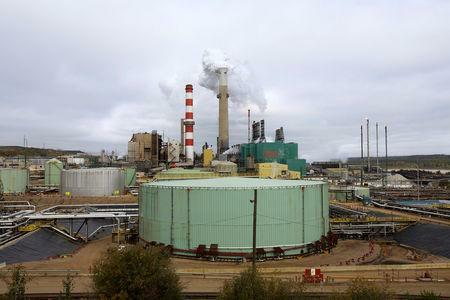 Most of the oil produced in Canada is thick, heavy crude that comes from northern Alberta's oil sands. Some is then put through a full upgrading process at great cost, turning that crude into synthetic light oil. Other heavy crude must be diluted with light oil - an extra expense - to travel through pipelines. "Our crude oil would have a tailor fit to refineries, so we would have no problem to find the market," Value Creation Chief Executive Columba Yeung said in an interview. In 2018, the United States imported 2.4 million barrels of medium, sour crude per day, only 15 percent of which came from Canada, according to IHS Markit. "There's a case to be made for product diversification," said IHS Vice President Kevin Birn. The timing for partial upgrading comes with risks, however. Alberta's New Democratic Party government is facing a tough spring election, and by the time the first upgrader is finished in 2022, additional pipeline capacity may be open, reducing the urgency to remove diluent from shipments to free up space. The opposition United Conservative Party would review the viability of any subsidized energy projects if it forms a government, said Prasad Panda, the party's energy critic. Developers of a dozen partial upgrading technologies, including MEG Energy Corp, are undeterred, however, and hope Value Creation's plant is only the first. Among the other companies grappling with ways to help alleviate Alberta's problem is Calgary-based Fractal Systems, which intends to profit mainly by removing and reselling diluent from heavy crude. "It's really important that we get some of these technologies out of the lab and into development, because there's potential there," Camarta said.